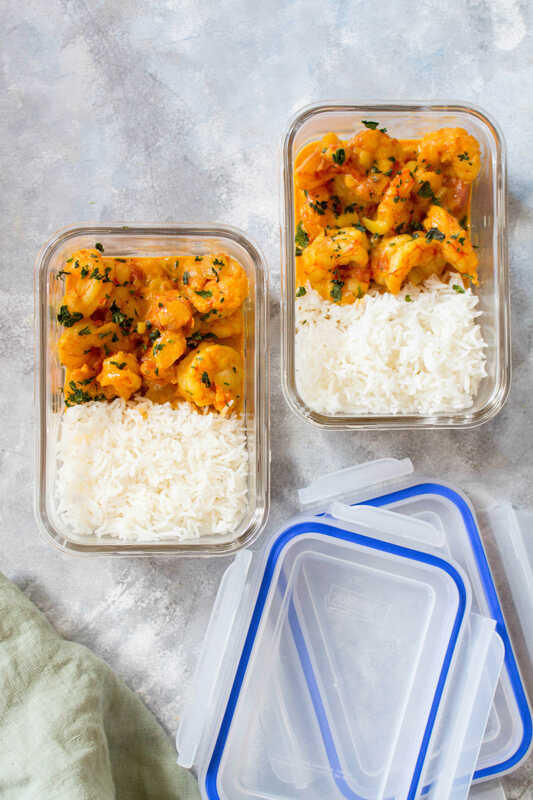 Made in under 30 minutes, this Curry Shrimp Meal Prep is so easy to make! 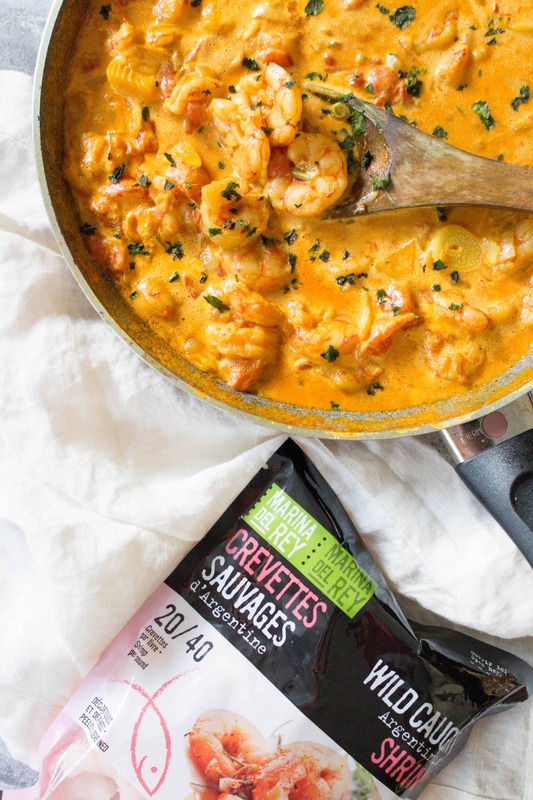 These Wild Caught Argentinian Shrimp are coated with a delicious silky coconut curry that will have you reaching for seconds! It is perfect as a quick night dinner or as a meal prep. Winter has definitely hit Toronto as I’ve been trying to shovel my way in AND out of my home. It’s so awful right now that the only time I’d brave it outside (other than to go to work) is to walk the dog! Needless to say, this weather has inspired a lot of cozy comfort dishes so that when I do have to put on 100 layers to go to work, I get to eat something warm and comforting. 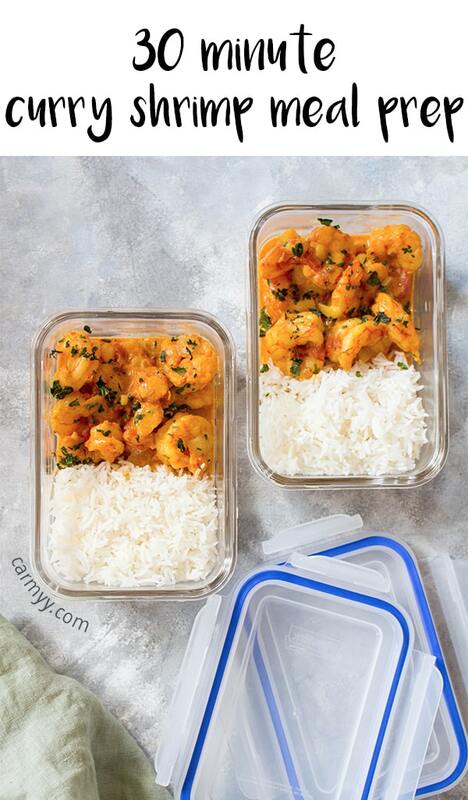 This curry shrimp meal prep hits just the spot. it’s warm, sweet but savoury, and rich and creamy thanks to the coconut milk. You can straight up drink this curry sauce and I would not judge you! 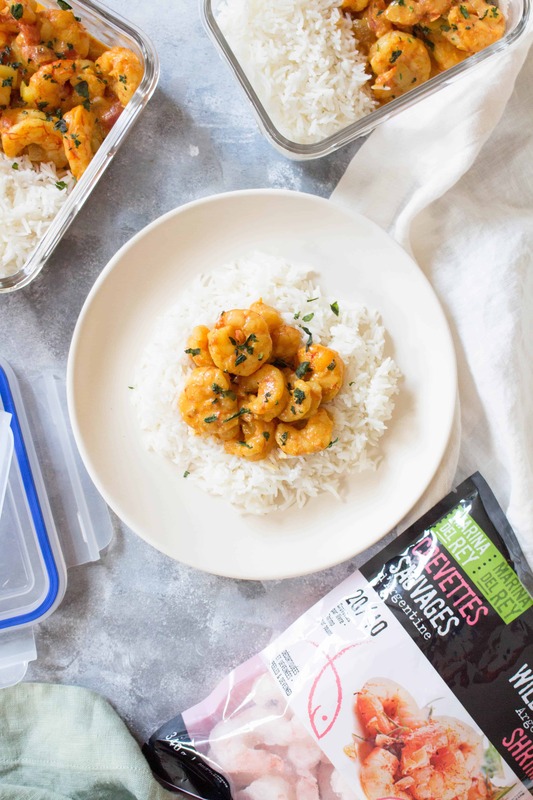 For this curry shrimp meal prep recipe, I used Marina Del Rey‘s Wild Caught Argentinian Shrimp. 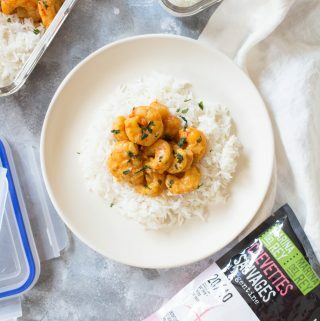 I went with Marina Del Rey’s Wild Caught Argentinian Shrimp because they have this delicious natural sweetness to them that pairs perfectly with the rich and creamy curry. 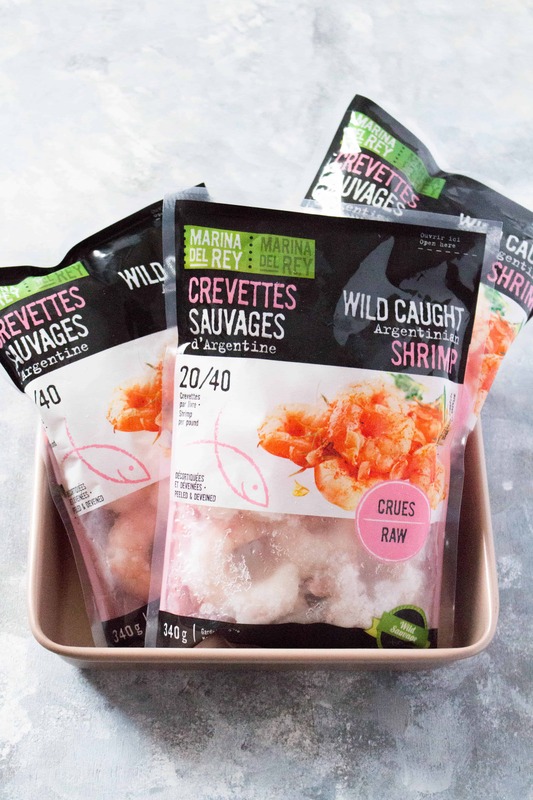 In addition to being a delicious choice, being wild caught, the shrimp is free from added antibiotics, hormones, and dye. 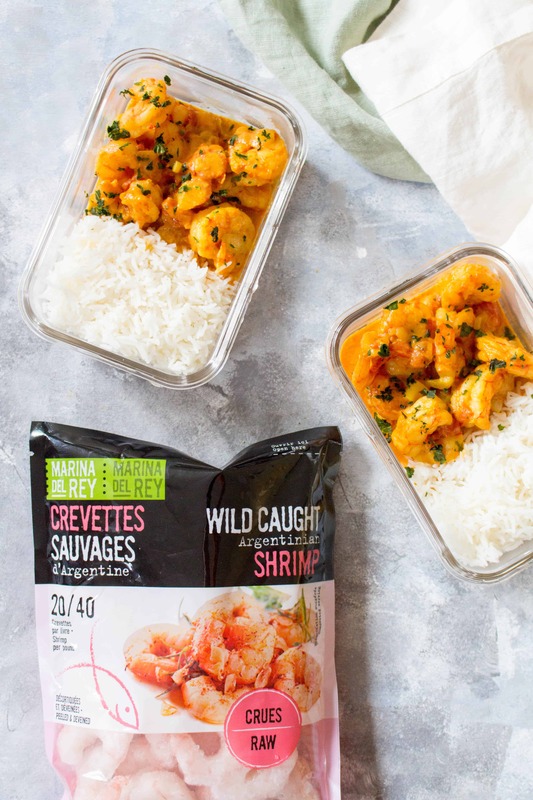 One of my resolutions this year is to keep a more careful eye on what I’m consuming so I’ve been picking the wild shrimp over a farmed shrimp. Bonus: they have a peeled and deveined version of their Argentinian shrimp (the one I’m using!) 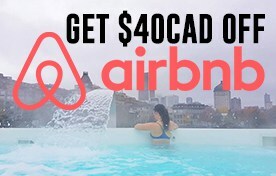 which makes meal prepping much faster! Thaw the shrimp according to the instructions on the bag. 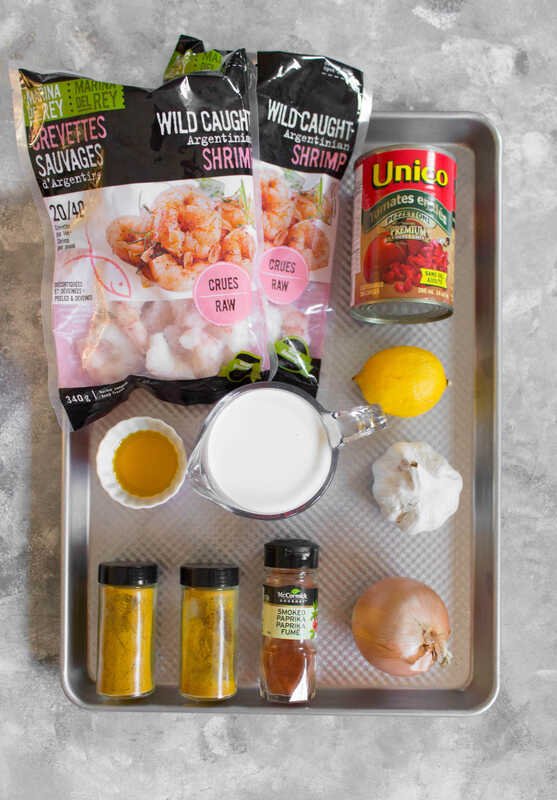 Once thawed, marinate the shrimp with some paprika, salt and pepper, and lemon juice. Let it marinate in the fridge while you cook the curry. In a hot pan, add your ghee and onion. Cook until the onion has soften then lower the heat add in garlic, cook for a minute. Still on low heat, add your curry powder and turmeric, stir, careful not to burn the spices. Quickly add your tomatoes and coconut milk. Increase the heat until your curry comes up to a boil and then reduce the heat so the curry is gently simmering before adding the shrimp into the pan. Allow the curry to simmer until the shrimp has cooked through, around 2-5 minutes or until the shrimp has turned pink. Serve over rice or portion it out to your meal prep containers. I love olive oil but when making curry, I’d recommend skipping the olive oil. I use ghee for this recipe (or you can use butter) to give it a nuttier flavour. Be sure to lower your heat before putting in the powdered spices into the pan, you don’t burn the curry powder as that leads to a bitter curry. Did you end up with a bitter curry? It happens! You can add more coconut milk or some brown sugar to the curry to fix the flavour. This recipe lasted 3 days in the fridge for me, I stored it in these airtight containers. Allow the curry to simmer until the shrimp has cooked through, around 2-5 minutes. I love curry of any kind. But it’s so good with shrimp! We’ve had mostly cold rainy weather with a couple of small snow accumulations, but the wind makes it feel so much colder. 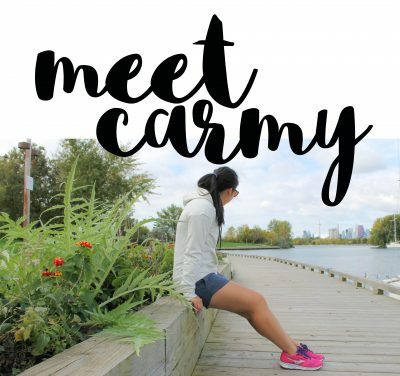 Definitely ready to curl up with some curry!